Interstates 39 south & 90 east separate with Interstate 94 on the east side of Madison, Wisconsin. I-94 bee lines for Milwaukee while I-39 & 90 remain paired south to Beloit and Rockford, Illinois. Photo taken 05/30/11. Interstate 39 runs north-south through Illinois and Wisconsin as a long distance bypass for traffic around the Chicago and Milwaukee metropolitan areas. A mostly rural route, I-39 begins on the north side of Normal at I-55, overtaking U.S. 51 north to Peru and La Salle, where it meets Interstate 80. North from there, the freeway continues to I-88 outside Rochelle and U.S. 20 on the south side of Rockford. U.S. 20 turns the freeway east to Interstate 90, the Jane Addams Memorial (Northwest) Tollway. I-39 & 90 combine there along the east side of Rockford to Beloit, Wisconsin, where they meet the south end of Interstate 43. Advancing northward, the pair pass through Janesville while en route to the capital city of Madison. There Interstate 94 ties in from Waukesha and Milwaukee to the east to form the longest three-way overlap on the Interstate system. Interstates 39, 90 and 94 share 29 miles of freeway along a northward heading from Madison to the outskirts of Portage. I-39 separates with I-90 & 94 just beyond the Wisconsin River to again overtake U.S. 51 northward from Portage to Packawaukee, Plover and Stevens Point. U.S. 10 combines with Interstate 39 & U.S. 51 from Stevens Point to a August 2012-completed freeway leading west to Junction City and Milladore. U.S. 51 otherwise parallels the Wisconsin River north to Mosinee, Rothschild and its terminus at the south junction of U.S. 51 and Wis 29. U.S. 51 extends the freeway north along side Wis 29 to Wausau and as a solo route northward to Merrill. A long term project underway in south central Wisconsin, the I-39/90 Expansion Project, affects 45 miles of the Interstates 39 & 90 overlap from the Illinois state line to U.S. 12 & 18 at Madison. The 1960s-era freeway includes 11 interchanges with elements of substandard design. Upgrades to the corridor include expansion of the freeway mainline to six overall lanes, reconfiguring the aforementioned interchanges, and additional expansion of I-39 & 90 to eight lanes between Wis 11 (Avalon Road) north to Wis 26. Construction runs from 2015 to 2023. The conversion of Exit 177 with Wis (Avalon Road) to a diverging diamond interchange will be the first DDI in the state. Further south at Beloit, a major upgrade projected to start in summer 2019 will revamp the southern terminus of Interstate 43 at Wis 81. The current full-cloverleaf interchange there will converted into a semi/directional T for freeway to freeway movements and a DDI for movements to Wis 81 leading west into Beloit. Interstate 39 was complete between I-80 near La Salle and I-90 at Rockford. 1986 Gousha North American Road Atlas. Interstate 39 overlays or parallels U.S. 51 for nearly its entire length. With the possible exception of the segment between I-90 & 94 and U.S. 51 at Portage, Interstate 39 is cosigned with at least one other route for all 306 miles. When commissioned in 1984, Interstate 39 was only constructed and signed between Former Illinois 5 (East-West Tollway/Interstate 88) and U.S. 20 at Rockford. The section between Illinois 5 and Interstate 80 was opened in 1986. In December 1987, another segment of I-39 was opened from I-80 across the Illinois River, south to Old U.S. 51 (now Illinois 251). Between 1987 and 1992, the section of I-39 between IL 251 and Bloomington-Normal was constructed. AASHTO approved the extension of Interstate 39 from Rockford, Illinois north to Wis 29 in Wausau, Wisconsin, on October 22, 1993. 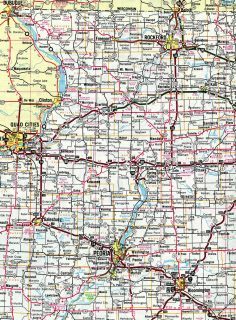 1984 – Interstate 39 from U.S. 20 near Rockford to Illinois 5 near Rochelle was opened. 1986 – Interstate 39 extended from Illinois 5 to Interstate 80. December 1987 – the section from Interstate 80 south across the Illinois River was opened and its southern terminus was Illinois 251 (old U.S. 51). It was not open from Illinois 251 to Illinois 71. Named the Abraham Lincoln Memorial Bridge, at one mile in length, the span is the longest in Illinois. Summer of 1990 – Interstate 55 was reconstructed around Normal to handle an additional lane of traffic. The existing interchange of U.S. 51 and I-55 was closed completely and then reconstructed with its present configuration. Bridge work continued for the overpasses between Normal and Oglesby. The section from Oglesby to Normal utilizes a unique style of overpass construction that allowed for the elimination of the center pier. U.S. 51 was rerouted onto the Interstate 55/74 bypass around Bloomington-Normal, and the main route town was designated as Business U.S. 51 (AASHTO action taken established Business U.S. 51 on June 2, 1990). Summer/Fall of 1991 – segments of the new highway were opened south to Illinois 18. May 29, 1992 – 4.4 miles of I-39 opened between Hudson and Kappa. October 31, 19928 – final segment of Interstate 39 opened, completing the entire freeway from Rockford to Bloomington. Illinois 251 extends on most of the old U.S. 51; some minor rerouting was necessary because the new four-lane highway was built on top of the two-lane road. It is interesting to note that Illinois 251 terminates just north of Normal, while the four-lane Business U.S. 51 was constructed over the old U.S. 51 for several miles north of Normal. There is a gap of several miles between the two. October 22, 1993 – Interstate 39 extension to Wisconsin approved by AASHTO. Mid-1995 – rest areas were opened on both sides of Interstate 39 between Rockford and LaSalle (I-80). Prior to this time, “phantom exits” were built to illustrate where the actual ramps would be. Also, before the rest areas opened, “Truck Pull-Off Areas” existed on both sides of the highway several miles north of the rest areas. These were later closed and fenced off to prevent access. 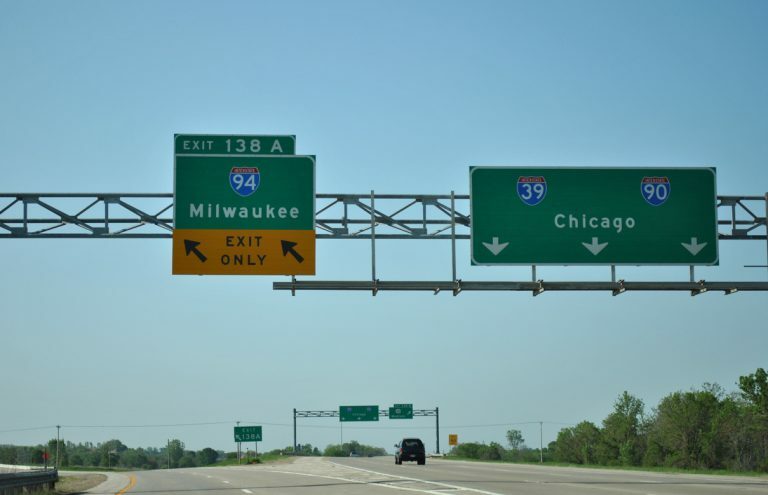 1998-1999 – Interstate 39 extended again, this time into Wisconsin. Signage was placed first on the U.S. 51 freeway from Portage north to Wausau, and co-signage with Interstates 90 and 94 was added thereafter. 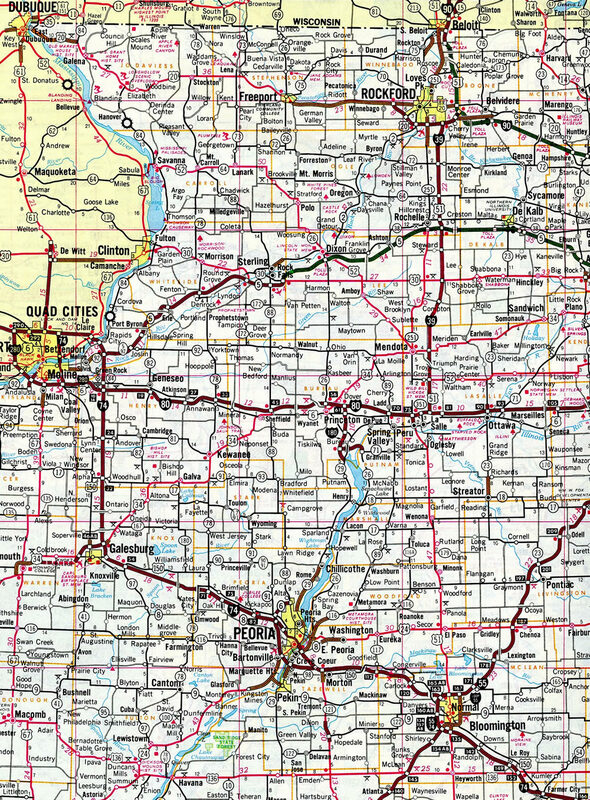 The 1999 Rand McNally was the first atlas to show Interstate 39 along these routes through Illinois and Wisconsin. 2003-2004 – At the Interstate 39/90 interchange in Rockford (Cherry Valley Interchange), the southbound toll was eliminated in December 2003, and the toll booth was torn down. The northbound toll was eliminated in November 2004. This was the last Interstate 39 and U.S. 51 north reassurance shield assembly. It was posted just north of the overpass at Maple Ridge Road near Milepost 182. Photo taken by Jay Maynard (12/02). A diagrammatic overhead outlines the movements at the three-wye interchange (Exit 187) with Wisconsin 29 east. Wis 29 west joins U.S. 51 north to serve Wausau before resuming a westward heading to Chippewa Falls. Photo taken 06/15/15. An end shield for Interstate 39 appears just ahead of the off-ramp (Exit 187) to Wis 29 east to nearby Schofield and Weston. Photo taken 06/15/15. Wis 29 ventures east as an expressway to Shawano and Green Bay and Interstate 41. Photo taken 06/15/15. Wis 29 west merges onto U.S. 51 north beyond the overpasses pictured here. Photo taken by Chris Lokken and Sage Sulenta (04/14/07). U.S. 51 north & Wis 29 west overlap for 3.3 miles to the west of Wassau. This stretch of freeway was upgraded to Interstate standards. Photo taken by Chris Lokken and Sage Sulenta (04/14/07). The reassurance sign in the median after Exit 185 indicated only U.S. 51, which implied that Interstate 39 was coming to its end. This sign was removed by 2007. Photos taken by Jay Maynard (12/02). Beyond the Wisconsin River, this mileage sign showed that Wis 29, the terminus of I-39, was only 1 1/2 miles further north. This interchange sequence sign was replaced with a new overhead posted within the freeway median. Photo taken by Chris Lokken and Sage Sulenta (04/14/07). A look at Interstate 39 at Wis 29 east (Exit 187) before the interchange was reconfigured from a trumpet into a three-wye. Photo taken by Jay Maynard (12/02). Interstate 39 appears for the first time along the Wis 29 freeway west, two miles out at the Alderson Road overpass. Photo taken 08/14/09. Wis 29 leads away from U.S. 51 Business to span the Wisconsin River on the one-mile approach to Exit 170 with Interstate 39 south and U.S. 51. Photo taken 08/14/09. Adjustments were made to the diagrammatic sign for Interstate 39 south to include a MUTCD-standard Left Exit tab. An $18.8-million project was underway at the time of this photo. Work between April 29, 2014 and May 25, 2017 both widened and replaced the bridge deck over the Wisconsin River.9 Photo taken 06/15/15. Wis 29 west crosses the Wisconsin River prior to interchanging with the northern terminus of Interstate 39. The Wausau area is quite scenic with an abundance of trees and hills, including Rib Mountain, located just west of this interchange. Photo taken by Chris Lokken and Sage Sulenta (04/14/07). Beyond the Wisconsin River, Wis 29 expands to three lanes ahead of the left exit for I-39 & U.S. 51 south to Stevens Point and Madison. Photo taken 08/14/09. A slight change was made after 2009 with the addition of a Left Exit tab for 170. Photo taken 08/14/09. Two lanes of Wis 29 west turn northward onto the U.S. 51 freeway to Wassau and Merrill. This portion is not yet I-39, though upgrades have brought it up to Interstate standards. I-39 south combines with Interstates 90 & 94 at Portage for a three-way overlap to Madison otherwise. Photo taken 08/14/09. The three-wye interchange (Exit 170) between Wis 29, I-39 and U.S. 51 replaced a trumpet interchange. Grading from some of the original ramps remains visible both to the north and west of the exchange. Photo taken 06/15/15. Low bridges warning signs were previously posted throughout the Wausau area for Interstate 39/U.S. 51 south. They are no longer posted as road work replaced substandard overpasses in the area. Photo taken by Chris Lokken and Sage Sulenta (04/14/07). Wis 29 east combines with the U.S. 51 freeway leading south along the west side of Wausau. The two routes part ways at Exit 187 as Interstate 39 begins. This advance sign for Wis 29 east to Green Bay stands within the Rib Mountain Road interchange. Photo taken 06/15/15. The on-ramp from Rib Mountain Road forms an auxiliary lane southward to the three-wye interchange (Exit 187) with the Wis 29 east to Weston. Wis 29 is a full freeway from I-39 & U.S. 51 east to Ringle. The Trunk Highway extends east from there with expressway standards to Green Bay with a 65 mile per hour speed limit amid a mixture of at-grade intersections and few interchanges. Photo taken 06/15/15. Interstate 39 finally makes an appearance as two lanes part ways for Wis 29 east. I-39 parallels the Wisconsin River southward as a rural freeway to Stevens Point, where it combines with U.S. 10. Photo taken 06/15/15. Southbound Interstate 39 and U.S. 51 approached Exit 195, some eight miles north of the northern terminus of Interstate 39 (at Exit 187). This was the first mention of I-39 along southbound U.S. 51. The exit in the distance is for U.S. 51 Business/Marathon County Road K, which was U.S. 51 prior to the construction of the present freeway. Photo taken by Jay Maynard (12/02). Looking at the south split of U.S. 51 and Wis 29 when a trumpet interchange joined the two freeways. Photo taken by Jay Maynard (12/02). The first reassurance marker for Interstate 39 stands by milepost 186.8 ahead of the Foxglove Road overpass. Photo taken 08/14/09. The first Interstate 39 south reassurance shield was previously posted at Milepost 185 beyond the folded diamond interchange with U.S. 51 Business for the Wausau suburbs of Rothschild and Schofield. Photo taken by Jay Maynard (12/02). U.S. 51 Business branches east from I-39 & U.S. 51, one mile north of Interstate 55 at Normal. Photo by 05/06/18. Interstate 55 encircles north side of Normal east to Business Loop I-55 (Historic U.S. 66) and west along side I-74 and U.S. 51 to Bloomington. Photo by 05/06/18. The final confirming marker for Interstate 39 south stands just ahead of the East 1800 North Road underpass. Photo by 05/06/18. Southbound I-39 partitions with the left exit for Interstate 55 northeast toward Chicago. The mainline defaults onto I-55 south, which combines with I-74 eastbound nearby. Photo by 05/06/18. An end shield appears along the ramp to I-55 & U.S. 51 south toward St. Louis and Decatur. Photo by 05/06/18. Replaced button copy signs at the south end of Interstate 39. Photo by Jeff Royston (11/01). Interstate 55 turns west beyond the split with Business Loop I-55 (Veterans Parkway) and runs along side Ironwood Golf Course ahead of Interstate 39. Photo taken by Brian Dowd (06/02). A collector distributor separates from the I-55 southbound mainline for both U.S. 51 Business (Main Street) to Normal and I-39 & U.S. 51 north to Rockford. Photo taken by Brian Dowd (06/02). Former button copy overheads posted ahead of the Linden Street underpass and the folded diamond interchange (Exit 165) with U.S. 51 Business (Main Street). Photo by Jeff Royston (11/01). Exit 164 departs from I-55 south for I-39 & U.S. 51 north to Peru, La Salle and Rockford. U.S. 51 south overlaps with I-55 and I-74 to the west side of Bloomington. Photo by Jeff Royston (11/01). Back to back trumpet interchanges connect Interstate 55 with I-74 west to Peoria and I-39 north to Rockford. Photo taken 05/07/10. The on-ramp from I-74 east to I-55 & U.S. 51 north adds an auxiliary lane to Exit 164 with Interstate 39 north. Photo taken 05/07/10. Sign bridge replacements made by 2008 along Interstate 55 around Normal included this assembly two miles south of I-39 north. Photo taken by Brian Dowd (08/16/02). Interstate 74 splits with I-55 & U.S. 51 north via a single lane ramp for its continuation west to Peoria and the Quad Cities. I-55 curves northeast one mile to the south end of Interstate 39. This sign bridge was also replaced by 2008. Photo taken by Brian Dowd (08/16/02). These button copy signs were removed by 2008. A single overhead for I-39 & U.S. 51 north to Rockford was added in place. Photo taken by Brian Dowd (06/02). U.S. 51 combines with I-39 north 124 miles to their merge with I-90 (Jane Addams Memorial Tollway) in Rockford. Photo taken by Brian Dowd (08/16/02). Interstate 39 & U.S. 51 north leads away from Normal across agricultural areas to Hudson. A signing oddity, this overhead assembly references the I-39 starting point… Photo taken 05/07/10. Advancing north toward the end of U.S. 51 Business, motorists pass by the first reassurance shield for I-39. Photo taken 05/07/10. A rare state named shield for Interstate 39 was previously posted north of the East 1800 North Road underpass. Photo by Jeff Royston (11/01). Eric Conn, personal email (“Wisconsin 29”), Tuesday, November 30, 2004. “Madigan to dedicate Giorgi Highway today.” Rockford Register-Star, April 17, 2003. Robb Haukohl, personal email (“I-39 Updates”), Wednesday, March 30, 2005. “I-90/39 Ramp Project.” WIFR.com, July 23, 2010. “Jane Addams Memorial Tollway – Newburg Road to Rockton Road – Reconstruct & Widen” Illinois Tollway, press release, November 24, 2009. Chris Lokken, personal email (“Some information on Wisconsin’s interstates”), Friday, April 7, 2006 and May 11, 2006. Todd Applegate, personal email (“Updates on I-39/90/US 20 in Rockford, IL”), December 28, 2007. “Completion of last link ends the 47-year-old saga of I-39” Pantagraph, The (Bloomington, IL), October 31, 1992. 511 Wisconsin Construction Projects – October 22, 2015 Weekly Construction Update. North Central Region, Weekly Updates. US 51/WIS 29 project http://www.dot.wisconsin.gov/projects/d4/us51wis29/index.htm, WisDOT project web site. Page updated June 14, 2018.